With the widespread proliferation of the Internet and the dominance of the World Wide Web, our shopping behavior has changed radically. Call it revolution or call it disruption; whatever it is, it’s sweeping through retail, destroying the good old brick and mortar stores and well-established brands and changing the way we shop. This next generation of shopping experience has brought the well-known brands to their knees. The retail as we used to know has changed and with it, the very experience of shopping. The digital era has fueled the explosive growth of e-Commerce while bidding goodbyes to the pure offline models. Major retailers are almost disappearing from the picture, especially with more and more e-Commerce players taking over the landscape. AliExpress and Wish are two such popular online shopping retail companies which share a significant piece of the vast e-Commerce landscape. Both are popular online marketplaces that represent the latest trends in online retail by opening a new world of possibilities for savvy shoppers and bargain hunters. While both sell millions of high-quality items at insanely discounted prices, there’s a lot to how the two marketplaces operate. Let’s see how the two stand up to each other. AliExpress is a global e-Commerce platform and the international arm of the China’s leading e-Commerce giant Alibaba Group. AliExpress was launched as the overseas platform for Alibaba in 2010 to compete against the other online retail giants like eBay and Amazon. It was quick to gain traction and in a short period of time, it showed rapid growths in the emerging markets with 700,000 registered users in Russia alone. Alibaba is the world’s fifth-largest online retail company by revenue and one of the major players in the e-Commerce landscape. AliExpress (aliexpress.com) sells everything from clothing, jewelry, and toys to phones, electronics, and sports equipment at jaw-dropping prices. Big brands and businesses market and sell their products on the AliExpress online platform, with most of the sellers and manufacturers based out of China. Wish is an online retail company and an online marketplace that allows you to shop through thousands of different products across multiple categories, all at heavily discounted prices. Wish was founded in 2010 by two former Google programmers, Peter Szulczewski and Danny Zhang. It started as an affiliate site allowing users to create wishlists and purchase products from third-party sites. Today, Wish sells directly to its hundreds of customers worldwide over 100 million high-quality items at discounted prices. The company managed to stay under the radar for a very long time until recently when the 5-year old startup reportedly walked away from a $10 billion offer from Amazon. Wish is doing business under the ownership of California-based ContextLogic Inc., from which the online marketplace Wish evolved. AliExpress is a global e-Commerce platform and the international arm of the China’s leading e-Commerce giant Alibaba Group, which sells everything from clothing, jewelry, and toys to phones, electronics, and sports equipment at jaw-dropping prices. Most of the sellers and manufacturers on AliExpress are based in China. Wish is an online retail company and an online marketplace that allows you to shop through thousands of different products across multiple categories, all at heavily discounted prices. Wish operates its business under the ownership of California-based ContextLogic Inc., from which the online marketplace evolved. While almost every product you can find on the AliExpress site or app can also be found on the Wish site or app, the items on AliExpress are relatively cheaper than that in Wish. This is probably because Wish takes 10% of the price of the products from the seller, whereas AliExpress only takes 5%, keeping profit margins to the minimal. So, the cost of selling items on AliExpress is cheaper for the sellers and retailers. Wish is also a low-cost online marketplace that sells items at competitive prices through its mobile app. The only downside to shopping with AliExpress is that most of the retailers and wholesalers are based in China and being an online market for everyone, the credibility of sellers is questionable. This means long turnaround times, delays in delivery, unscrupulous sellers, bad-quality or ill-fitting items, and overpriced shipping charges. So doing your research is advisable when dealing with sellers. Wish, on the other hand, cater to millions of consumers in the U.S. and Europe, and its sellers are located all over the world, so it’s relatively safer to shop on Wish than AliExpress. While both AliExpress and Wish are the major players in the online retail landscape, they follow a slightly different market strategy to cater to their millions of consumers worldwide. The price of products on AliExpress is fairly less expensive than Wish. This is because sellers only pay 5% of the price of the products on AliExpress compared to what they pay on Wish, which is 10% of the price of the items. Wish also sells high-quality products at heavily discounted prices and is starting to establish its online presence as one of the major players in the e-Commerce space. Sagar Khillar. "Difference Between AliExpress and Wish." DifferenceBetween.net. 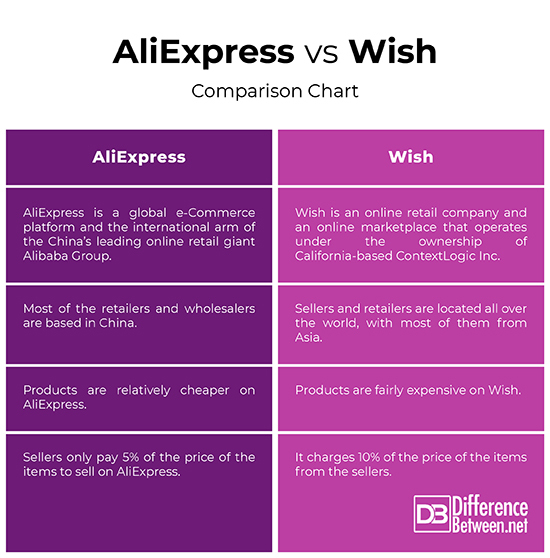 February 11, 2019 < http://www.differencebetween.net/technology/difference-between-aliexpress-and-wish/ >.